In the early hours of Wednesday 18 October 2017, occupation forces launched a series of raids deep into Palestinian Authority (PA) administered areas. In a move that has become more common over the past few years, they specifically targeted media outlets, news agencies, and journalists. A total of eight branch offices of three different media companies where raided, and sealed, with two journalists being arrested. 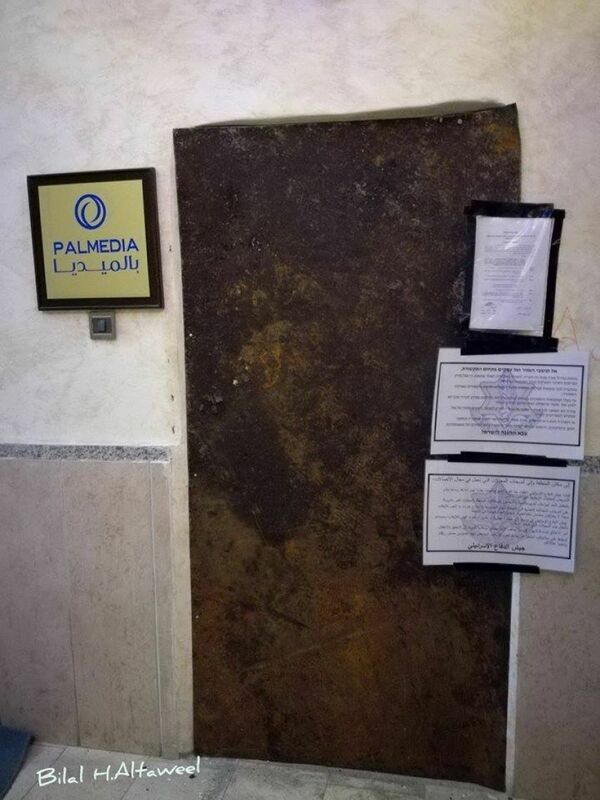 Offices owned by PalMedia, Ram Sat, and Trans Media, which are rented by the news agencies al-Quds, al-Aqsa, and Palestine Today, had broadcasting equipment, computers and distribution equipment confiscated. In addition, their offices were welded shut with notices placed on the metal plaques declaring that their closure had been decreed by the military commander for the occupied territories due to their having been engaged in incitement. They are to be closed for six months, or will face further punishment. In addition to the closures, the occupation forces arrested journalist and owner of Trans Media, Amer Mohammed al-Ja'abiri, and his brother Ibrahim, who is the administrative director of the same company. These raids come after the closing of Hebron's Manbar al-Hurriya radio station, which was also closed for six months on the grounds of incitement. What should be evident from these arrests is that no matter what your definition of incitement might be, there is very little possibility that the these three widely read and viewed news agencies were all engaged in such an act. These raids, and this campaign against Palestinian journalists, represents nothing more than an attempt to use force against the dissemination of truth. It represents an instance of the powerful seeking to blind the oppressed to their own plight. Addameer strongly condemns these actions as a violation of the Palestinian people's right to freedom of expression, self-determination, and an affront to their basic dignity. Despite their best efforts, the occupation does not seem to understand that silencing the messenger does not mute the message.